Unfortunately, I couldn’t make it to the Vivienne Tam Fall 2009 presentation on Wednesday night, but I just got the deets and obv, need to share them. Based on the concept of “nothingness”, a space in which anything can happen, Vivienne Tam’s Fall 2009 collection spotlighted rich jewel tones (think the designer’s signature red, deep purple and teal) and neutrals, along with a keen mixing of textures and layering of fabrics. The Chinese character for “nothingness” – “wu” – was a theme featured in several collection pieces and when repeated as a sound, it becomes an effective mantra. Tam again collaborated with HP, this season incorporating a live blogging station that featured their innovative new TouchSmarts. Leading bloggers and online media were invited to instantly share their opinions and experiences via the stations. Tam is the first designer to extend a hand to online media in this way. In doing so, she demonstrated a fundamental understanding in the role online media plays in the changing landscape of fashion.We bloggers salute you, Vivienne! 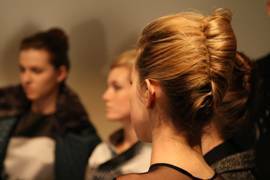 The hairstyles for the show were created by lead stylist Nexxus Creative Director Kevin Mancuso. He offered a fresh take on the classic French Twist. With an unstructured crown and a sleek upsweep, the look was both modern and elegant. Distribute a medium-hold mousse, such as Nexxus Mousse Plus, throughout hair to add body and maintain/support the structure of the style. Separate the front section of hair and leave aside. Sweep loose hair to one side and secure in place with bobby pins. Spray hair with a lightweight hairspray, like Nexxus Comb Thru, for hold with movement. Twist the hair back over the bobby pins and tuck in, creating the twist. Secure twist with bobby pins. Spray again with Nexxus Comb Thru to secure the style. Take front part of hair and blow dry with a medium-sized round brush for added body. Pull hair back and secure into the top of the twist with bobby pins. This will help add volume to front. Finish look with a strong-hold hairspray, like Nexxus Maxximum, to keep style looking runway-ready all day long. Click to see my coverage backstage at Vivienne Tam’s Fall 2008 collection and her Spring 2009 collection. Check Out the Vivienne Tam Show From Your Computer!